See clearly, drive safely. Your vehicle is bombarded by pollution every day; acid rain, industrial fallout, rail dust, tree sap mist, tar, mineral deposits, and salt. A glass cleaner – even a good one – cannot remove contamination that has bonded and, in some cases, has become embedded in the glass. 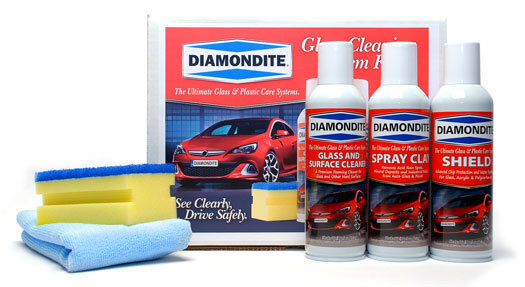 But the Diamondite Glass Cleaning & Protection System can. The Diamondite Glass Cleaning & Protection System was the first glass cleaning kit to address not just the dirt on the outside of the glass, but also the debris lodged in the glass. Using first-of-its-kind Spray Clay, this kit cleans glass deep within its microscopic channels until it is once again as smooth as glass! Diamondite Glass and Surface Cleaner is a foaming aerosol cleaner super-charged with special detergents that target and remove embedded contaminants from the glass' microscopic grooves. The foaming cleansers actively surround and lift oil and dirt deposits so they easily wipe away. Use Diamondite Glass and Surface Cleaner to prep the glass for Spray Clay and then following Spray Clay to remove any remaining residue. All glass cleaners are not made equal; Diamondite Glass and Surface Cleaner is in a league of its own when it comes to clean glass. The nucleus of the Diamondite Glass Cleaning & Protection System is Diamondite Spray Clay. 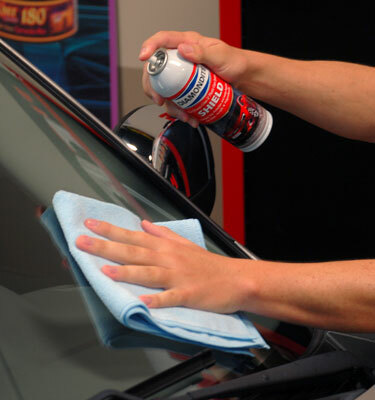 This product makes it easy for anyone to make a significant change in the appearance of dirty, aged auto glass. Using kaolin clay, Spray Clay bonds to contaminants, even oil, and completely removes them. Kaolin clay is an ultra pure clay that naturally absorbs oil and collects dirt from any surface to which it is applied, including your skin. Kaolin clay is found in countless cosmetic products due to its cleansing properties. Diamondite applies those same properties to car care and the results are amazing. Spray Clay pulls oil and dirt out of the glass' "pores", microscopic channels that collect debris and oil from the road. 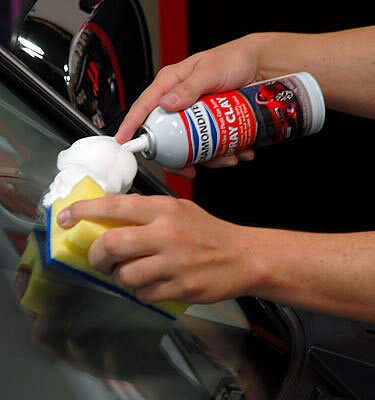 Combined with lubricants, kaolin clay deep cleans glass without scratching. Spray Clay removes oil, dirt, tar, tree sap mist, insects, industrial fallout, environmental contaminants, rail dust, mineral deposits, and more. The kaolin molecules grab and absorb foreign particles on the glass to leave it perfectly smooth and optically clear. Diamondite Spray Clay cleans without compounding, and it is acid and silicone-free. Simply stated, there is no other product like it. The Speed Sponge enables Spray Clay to loosen and remove contaminants from the glass with greater ease. The lubricants in Spray Clay prevent scratches as the Speed Sponge helps erase water spots. Diamondite Shield is a polymer protectant that seals fine scratches and chips to create a smooth, uniform surface. This coating increases visual acuity and provides scratch resistance against everyday threats, like sand and small stones. The polymers reduce surface friction to allow water to bead and roll off. You will experience better visibility in the rain and at night. The slick Shield also deters dirt and ice from bonding to the glass for easier removal. Diamondite Shield protects your windshield and windows from water spots and acid rain damage with a crystal clear, repellant coating. See clearly, drive safely. Clean the glass well with Diamondite Glass and Surface Cleaner and a Cobra Waffle Weave Glass Towel. Shake the can of Spray Clay well. Invert the can and spay a line of Spray Clay about 1 ft. long across the glass. Use the Speed Sponge to spread the Spray Clay, using very little pressure. Rub lightly back and forth over the Spray Clay. Let the clay dry to a haze and then buff off using a microfiber towel and Diamondite Glass and Surface Cleaner. Continue in this manner until you have cleaned all windows and the windshield. Shake well. Spray the glass with a light coat of Diamondite Shield. Let the coating dry until tacky (about 5 minutes). Use a soft, clean microfiber towel to buff the glass until clean. If the glass is excessively hazy, remove Diamondite Shield with a damp towel and then buff dry. The coating will completely cure in 24 hours. 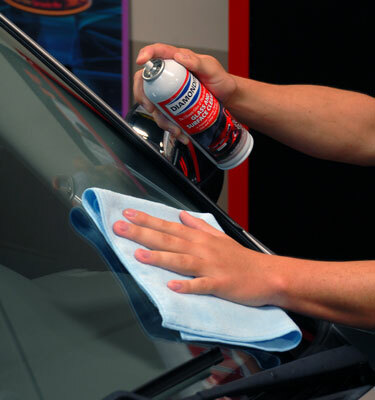 The Diamondite Glass Cleaning & Protection System will treat the glass on 5-6 vehicles.